Woody and Hugo deep in contemplation within Structure Fourteen. Okay, let’s get the weather out the way as soon as possible. It’s nice, there’s no precipitation and everyone seems happy, until Friday at least. And now for the really important stuff . . .
On just his second dig, and working high up on the remains of the midden baulk, which supported the water pipe, Alasdair, has uncovered a remarkable piece of pottery. The exciting new sherd of pot. Apologies for quality of the image — Nick was shaking too much with excitement. Better to follow tomorrow. 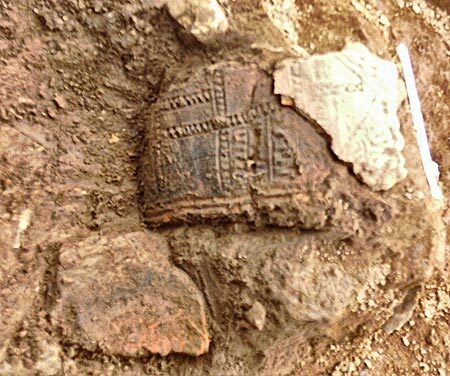 It is the decoration which is so interesting as it comprises incised cordons forming panels of different sizes, with the rectangular ones plain but others, including a triangular one adjacent, infilled by decoration which appears to be fingernail impressions. It has been examined by four pottery specialists and Professor Mark Edmonds, who is knowledgeable in most things, and nobody has seen anything quite like it before. As the day has progressed, he has found another piece of pottery in close proximity, but this time with the interior surface visible. If the buried side also has decoration, it may join with the original piece and thereby give us a better idea of a larger section of the decorative motif. We can even have a stab at dating it. Because of its context, it is clearly late in the sequence of the site and may be tentatively placed around 2300 or 2400BC. This is very late — indeed many specialists would say that Grooved Ware pottery was no longer being made at that date. Well, the longer you study pottery the more reluctant you are to make definitive statements, especially when the pottery is still in the ground. If that sounds like avoidance technique, it is. We’ll keep you informed. On the subject of pottery, we were delighted today to be visited by Dr Richard Jones, who has been looking at the earlier Neolithic site of Smerquoy and who is also involved in collaborative work with Ness personnel, including on the difficult task of establishing the exact components of the coloured pottery from the site. Richard had not seen the Ness before and was impressed. We wish him well as he travels to his beloved Greece next week. We are dubious about predictions of what may be discovered at the Ness, but site director Nick is beginning to rival the Brahan Seer. 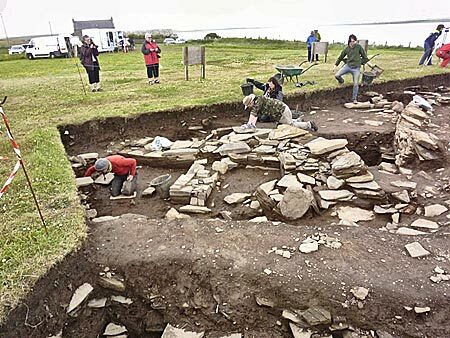 He predicted a hearth near the central standing stone and today, Owain, working in that area, has uncovered what looks remarkably like a hearth, associated with a stone box. Jo meticulously removes the first micromorph sample from Structure Eight. It is outside Structure Twelve, may be associated with the original build of that unlucky, but lovely, structure, and therefore may be dated to around 3,100BC. Jo McKenzie is very busy sampling one of the side recesses in Structure Eight, but she is encountering problems with the stony nature of the deposits. This may confirm a suspicion that the floor deposits there are quite thin, (at least in the side recesses) but these are just the initial samples of dozens which Jo will eventually take from Structure Eight. 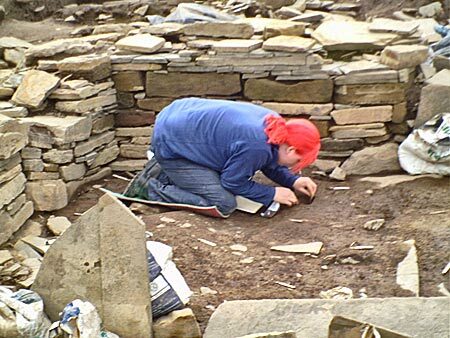 At the northern end of Structure Ten, Claire has uncovered a very large stone in a puzzling position, which may have extensive decoration on one of its surfaces. More of this later, indeed more of everything . . . tomorrow. Structure Twenty-One being given its spring clean by Jay and co.
Hi folks, my name is Jay, and this is my third year at the Ness. I’m from Nelson, New Zealand, so, yes, I am a long way from home, but as I explain it, the weather here is the same as my current winter, but with the bonus of daylight! 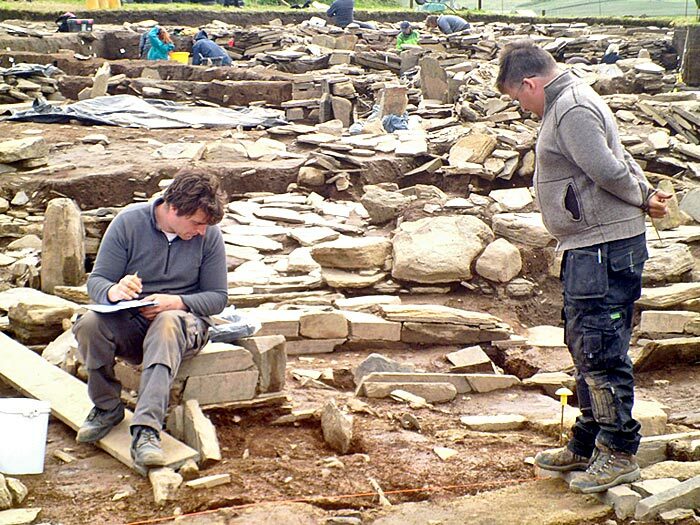 Unfortunately I had to miss this season’s first week, as I already had my tix back to the UK before I knew the dig had been expanded to eight weeks. So when I arrived in Mainland Orkney on Friday, I’d missed all the icky rain. I have since decided that I’ve chased the rain away and it’s going to be dry as a bone for the next seven weeks. Over the six dig weeks I’ve been here, between the 2013 and 2014 seasons, I’ve spent most of my time in Structure Twenty-One. This is behind Structure One, in the north-western corner of the trench, and presumably extends out underneath the soil heap. Yesterday I got to clean it back so it looks nice and pretty, but that will probably be it for this year. Beth and Mark carefully record the location of each find in 3D. I’ve moved over to the area of Structure Twenty-Five, which is between Structures One and Twelve. 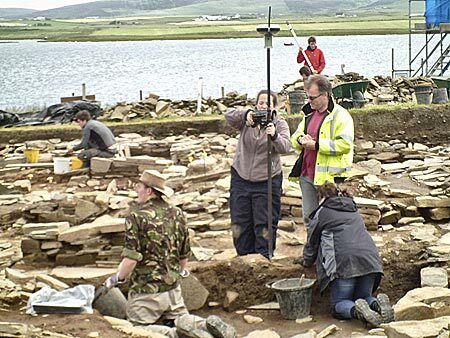 This area is under the watchful eye of Owain, where Jenny and Chris usually work. I’m looking forward to my time here as I frequently sit with Jenny during the breaks, while she waits for her husband, Chris, to remember to come get something to eat. So far, I have helped give the trench section here a light cleaning so that the section drawing can be extended down to what is now exposed. With this and (I think) three plan drawings and photos, some stones on top of the pavement area can then be removed. Whether or not the pavement areas here are contemporary is getting exciting as today Owain showed that the pavement goes below the remodelling (addition of annex) of the north end of Structure Twelve. 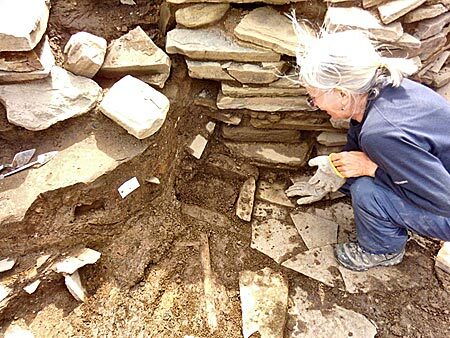 Then right next to this he found a possible hearth and box. It is awe-inspiring and thrilling that with a few sweeps of the trowel such exciting things can come to light. Thankfully, since I’ve being doing this for only about an hour, he’s still managing to hold on to his patience — although I might find myself assigned levelling the soil heap by the end of the day!